Bitcoin has finally broken out above the previous Bitstamp $2,980 all-time high. 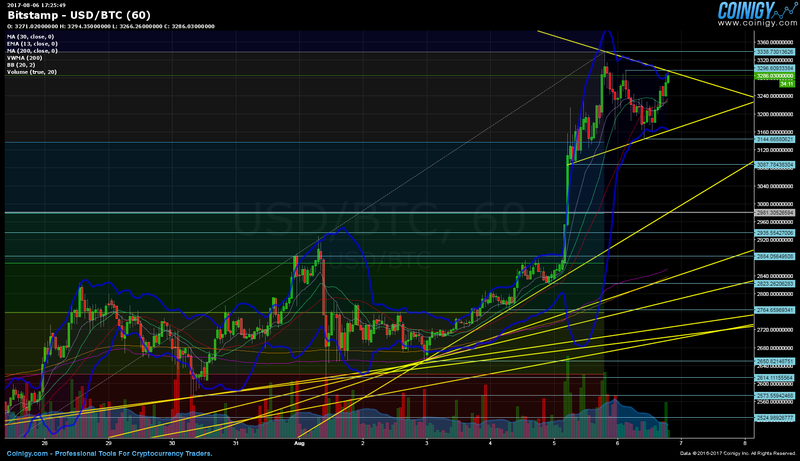 We are currently trending upward, in what appears to be a firm ascending parallel channel. Volume on the hourly is robust and strong; the price is just shy of clearing past $3,300. The BCC chain split has been completed, with a large number of exchanges offering support for bitcoin cash, and distributing numerically matching user coins in accordance with fork day account balances. Understandably, there is an obvious inverse correlation between BTC and BCC. Bitcoin cash is slightly below $190 as of this moment, the prevailing trend and market movement, points toward a further price correction of BCC, once the weekend is over. This is of course subject to change, if the ensuing bitcoin pump loses steam, or if there is a massive surge in volume (or a well prepared narrative event) tied to corresponding trading pairs. Bitstamp volume was very impressive during the markup, followed by a price increase of 27.8% from the current $2,614.11 August monthly low. Today’s hourly trading remains relatively constant, no extreme fluctuations as of yet. All resistance levels were decimated in the last 5 days of market activity, they are marked below with red trend lines. 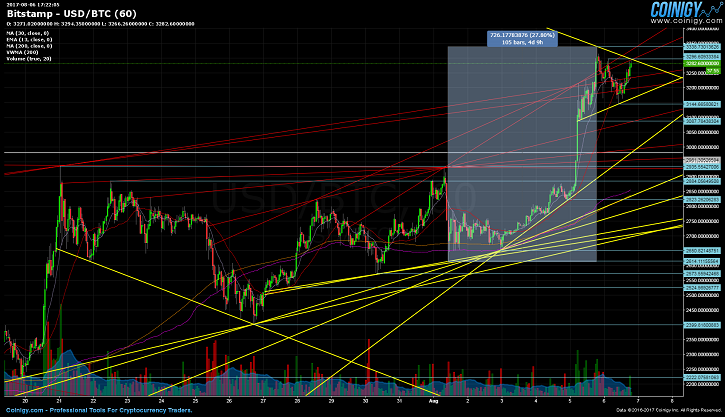 As for new resistance levels, there are few and far between at present. The first being the new $3,339.66 all-time high, while the second is at $3,296.60. This does of course make ample sense, since we have entered a new phase of price discovery. Fibonacci extensions calculated from the prior trading range, are displaying rather interesting levels, that can be applied in case of another rapid jump in price. The 1.236 fib is at $3,561.46, the 1.382 fib is at $3,698.68, the 1.5 fib is at $3,809.58, and lastly we have $3,920.48 (fib 1.618) and $4,279.51 (fib 2.0) at the higher end of the spectrum. The $3,144.66 primary support is also neighboring the 0.786 fib line, which is slightly below $3,136.75. 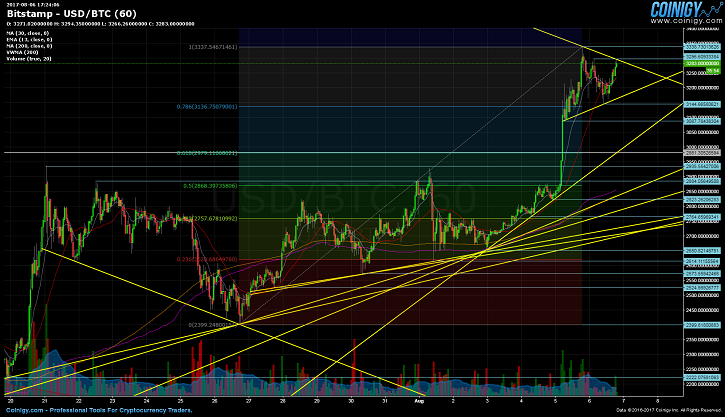 Next support is at $3,087.78, and after that we have to rely on the previous $2,980 all-time high. I sincerely doubt we are going to see a return below these thresholds, but if worse comes to worst, then the next support levels are at $2,935.55, $2,884.05, $2,823.26, $2,764.65, $2,650.82, $2,573.55, $2,524.98, and finally at the August 26 daily low of $2,400. Bollinger bands on the hourly have stabilized. Furthermore, the gap between the upper and lower bands seems to be shortening. Price is holding atop the median line, and has not gone over the upper band. The 4-hour is showing that the Bollinger bands have substantially widened, even if they are considerably beyond the median line, and quite close to the upper band. Regardless, it can be taken as a bullish sign for now. The daily on the other hand, has shown price breaking above the upper bands, a highly bullish signal to match the noticeably broadening band disparity. The 30-day MA has risen exponentially past the 200-day MA, although it does appear to be wavering a bit, and drawing out horizontally to a degree. A crossover of the 200-day MA over the 30-day MA is required, before an end to the existing run-up can even be considered. The RSI was demonstrating highly overbought conditions yesterday, but this trend has been waning, and we are closer to a more neutral standpoint at the time of this writing. The Williams %R is in a completely opposite situation, and is illustrating overbought circumstances. 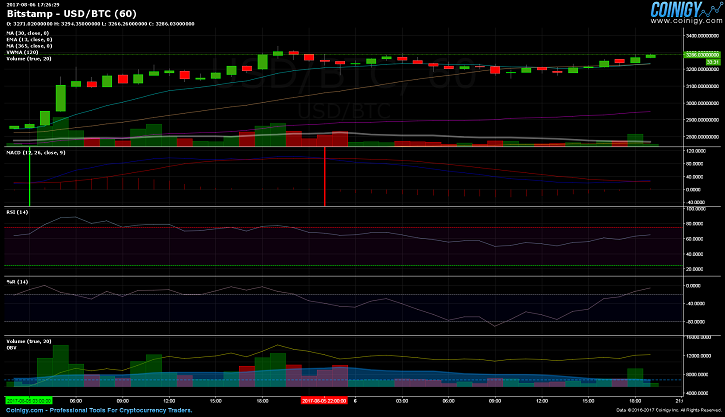 OBV has flat lined along with hourly volume, no conclusive data on potential price movement. The MACD is professing momentary bearish tendencies, chiefly due to a bearish crossover of the macd occurring below the signal line. This is the complete opposite of what happened during the preceding price climb, which was very well timed with a bullish crossover of the macd (marked with a green vertical line, bearish crossover is marked in red). Bitcoin began trading on August 1 at $2,925 (GMT 05:00), before dropping to the current August monthly low of $2,614.11. After a day of sideways trading, a gradual rise from $2,650.82 began on August 2 (GMT 21:00), which finally culminated with a new all-time high of $3,339.66 on August 5 (GMT 17:00). Trading has since then, kept to a range above today’s $3,144.6 daily low and the previously mentioned high.